Customer Experience (CX) is the new competitive differentiator. Marketers at Apple, Chrysler, Phillips, RBS and Lithium have tossed out traditional market segmentation and lead generation campaigns and drive bigger pipeline by delivering compelling experiences. This webinar brings together two CX experts for a lively discussion on how to marketers can design, deliver and measure compelling experiences that convert into revenue. You’ll learn how to uncover the experience your prospects value most, how to use that to differentiate your brand, and how to build marketing campaigns that get buyers to engage in your experience. It’s not enough to just deliver compelling experiences; you also need to measure if they are driving more preference for your brand and higher quality leads. 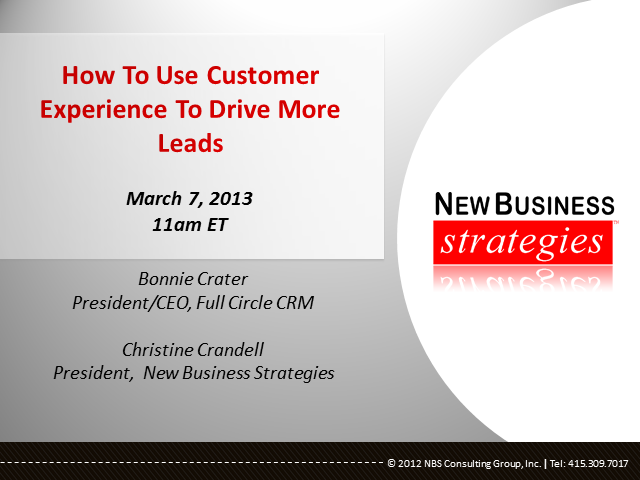 Bonnie is President and CEO of Full Circle CRM, a leading provider of Marketing Performance Management software. Prior to joining Full Circle CRM, Bonnie was vice president of marketing for VoiceObjects and Realization and held vice president and senior vice president roles at Genesys, Netscape, Network Computer Inc., Salesforce.com, and Stratify. In 2000, Bonnie was named one of the “Top 20 Female Executives in Silicon Valley” by San Jose Magazine. As President of New Business Strategies, Christine Crandell leads client services teams serving customers including Good Technology, Oracle, DotNetNuke, and McKesson. She is as one of the top twenty women in Sales and Marketing by the SLMA, one of the top 15 influential leaders in sales and lead management, one of the top 15 leaders in social selling, and one of Silicon Valley’s Most Influential Women by the Silicon Valley/San Jose Business Journal.